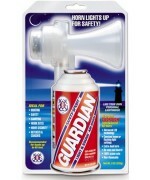 Only the GUARDIAN AIR HORN provides you with light and sound signaling All-in-One! It's like having your own private lighthouse... why would you leave the dock without it? Extremely Loud 120db Air Horn Power! * Can be heard up to 1 mile!